I've seen these listed on a few blogs recently and just had to post a review for them. They are absolutely fantastic! 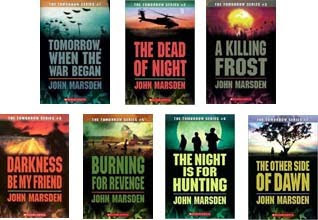 John Marsden is an excellent writer who has also written the equally brilliant Letters from the Inside and So Much to tell you. The 'Tomorrow' books are set in Australia and follow a group of friends who return from a camping trip to discover war has broken out and all their friends and family have been captured. The story is told from Ellie's point of view - who I fell in love with immediately - and is full of action and romance. The action scene are written so well you really feel the urgency and there are some quieter moments between the characters that really bring them to life. There are seven books in total and there is a series called the Ellie Chronicles that follows on from these (although I haven't read them yet - but they are on my ever mounting TBR pile!) Without wanting to sound cliched - I can't recommend the series highly enough! I'm reading the first one right now, and I'm loving it. I didn't realise there were seven books in the series, but right now I can see myself reading them all. I really can't wait for the film adaptation of this series--and I must read the Ellie chronicles too. I have the first book in the series, but haven't read it yet. Lots of Aussies love them, so I'm looking forward to reading it!